What a novel! The best I’ve read in quite a while. It’s about overprivileged people with boring lives. Too much writing about writing, and too much writing about college campuses, and worst of all, too much writing about writers on college campuses. Nothing really happens. You’re expected to accept minor alterations of feelings in lieu of plot. and gleefully makes itself guilty of all of them, while being nevertheless rich in life and incident, hilarious, stirring, and of its time. “Ralph!” I exclaimed, realizing that he was this guy I knew, Ralph. Whether you find this funny is probably a good test for whether The Idiot is gonna be your thing. What kind of writing bears this stamp? Guilt leads to the idea that all writing is self-indulgence. Writers, feeling guilty for not doing real work, that mysterious activity—where is it? On Wall Street, at Sloane-Kettering, in Sudan?—turn in shame to the notion of writing as “craft.” (If art is aristocratic, decadent, egotistical, self-indulgent, then craft is useful, humble, ascetic, anorexic—a form of whittling.) “Craft” solicits from them constipated “vignettes”—as if to say: “Well, yes, it’s bad, but at least there isn’t too much of it.” As if writing well consisted of overcoming human weakness and bad habits. As if writers became writers by omitting needless words. So what’s weird is that Batuman’s writing is exactly the kind that the creative writing workshop leaps to its feet and applauds. OK, there’s no leaping in creative writing workshop. It would murmur appreciatively. Her sentences are pretty damn whittled. Also clever. Scenes don’t overspill, they end just before the end. Batuman’s writing is both crafted and crafty — but not anorexic! Anorexia isn’t denying yourself what’s needless; it’s a hypertrophy of that impulse, its extension to a more general refusal. in-your-face in medias res, a maze of names, subordinate clauses, and minor collisions: “The morning after her granddaughter’s frantic phone call, Lorraine skipped her usual coffee session at the Limestone Diner and drove out to the accident scene instead.” …. A first line like “Lorraine skipped her usual coffee session at the Limestone Diner” is supposed to create the illusion that the reader already knows Lorraine, knows about her usual coffee, and, thus, cares why Lorraine has violated her routine. It’s like a confidence man who rushes up and claps you on the shoulder, trying to make you think you already know him. In later years, holding forth to an interviewer or to an audience of aging fans at a comic book convention, Sam Clay liked to declare, apropos of his and Joe Kavalier’s greatest creation, that back when he was a boy, sealed and hog-tied inside the airtight vessel known as Brooklyn New York, he had been haunted by dreams of Harry Houdini. and not say, oh, that’s how you do it. At the beginning of summer I had lunch with my father, the gangster, who was in town for the weekend to transact some of his vague business. Except Chabon focuses on rhyme (summer-father-gangster) while Batuman is all scansion — perfect trochees! Of course there are a lot of reasons I’m predisposed to like this. It’s about bookish, ambitious, romantically confused Harvard undergrads, which Batuman and I both were. There are a lot of jokes in it. There are some math scenes. So let me say it straight; The Idiot makes me think about the alternate universe where I stayed a novelist instead of going back to grad school in math, a universe where I spent years working really hard to sharpen and strengthen the work I was doing. This is the kind of novel I would have been aiming my ambition at writing; and I still wouldn’t have done it this well. The existence of The Idiot releases me from any regrets. One final note about the book tour — Elliot Bay Book Company, who handled sales at my talk in Seattle, won a special place in my heart forever, because not only did they have lots of copies of How Not To Be Wrong, they also brought along a small stack of The Grasshopper King! And they even sold a couple. Nice to see that little green paperback again. I checked The Grasshopper King, and nope: no barking dogs. There’s a ceramic dog, and one dog who howls (but who appears moments later, and is named) and finally, near the end, a talking dog. Me 1, cliche 0. In other Slate literary coverage, Dan Kois reviews Ben H. Winter’s novel The Last Policeman, a detective story set in a future where Earth is six months away from certain destruction by asteroid collision. When I was in college I took Spike Lee’s screenwriting course, and my screenplay was roughly on the same theme. It was a meteor heading for the earth, not an asteroid, and the atmosphere was supposed to be roughly that of After Hours or Into the Night. It was called Planet Earth. Lee’s total commentary on the screenplay, written on page 3, was “Some parts I laughed, some parts I didn’t,” and he gave me an A-. 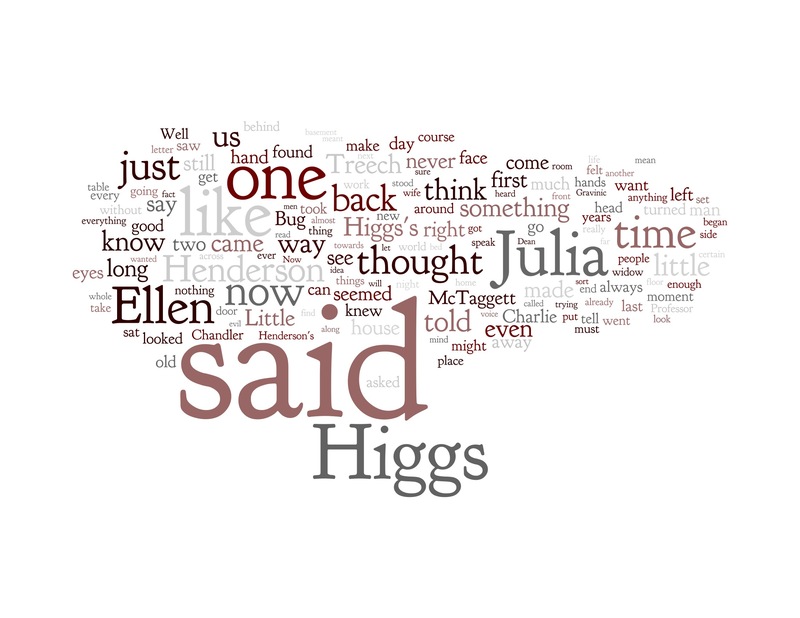 Since someone asked me today: yes, the Stanley Higgs who appears in my novel was named after the Higgs boson. I thought it would add a very slight tinge of cosmic mystery to the character. Not any more, I guess. Somebody out there liked my book. In fact, she singles out for praise a single sentence. And the sad truth is: I have no memory of having written this sentence. I guess I’d imagined her favorite sentence would be something I, too, would have singled out in my mind. But no. My father, a mild man, dedicated to prudent consistency, demurred. Anyway, I have a favorite sentence in the book, but I don’t care to reveal it. Instead, here are a couple of my very favorites from other people’s books. …the library, the dead core of my education, the white, silent kernel of every empty Sunday I had spent trying to ravish the faint charms of economics, my sad and cynical major. The sun was like a huge fifty-cent piece that someone had poured kerosene on and then lit with a match and said ‘Here, hold this while I go get a newspaper,’ and put the coin in my hand but never came back. I like the way this sentence is not a sentence, but reads as one. Grover Cleveland’s wife had a dog named Volapük. James Cooke Brown, the inventor of Loglan, had the time and disposable income to create a language because he also invented the boardgame Careers. Brown, a lifelong socialist, intended Careers to counteract what he saw as Monopoly’s overemphasis on making money as the sole goal of life. I was a major Careers fan as a kid and let me just say this point was utterly lost on me. This book pulls off a very difficult trick. Okrent is writing about people who are often strange and almost always, in one way or another, misguided. She gives you the full measure of their strangeness, but never deviates from her posture of bemused respect for the audacity and technical difficulty of the tasks they’ve set themselves. Good trick; good book. Here’s Okrent on Klingon speakers in Slate. Here’s her blog, which right now is just a list of book events. Here’s her bagel recipe. And here’s the longest text I ever wrote in Ilenga: a translation of the first verse of “Shout,” by Tears for Fears. I especially like the tiny “asked” inside the “d” of “said.” I think that’s just good luck; it would be impressive if Wordle knew enough to make up little figures of this kind. I wonder if most prose fiction would come out looking pretty much alike, apart from the names of characters? The predominance of “said” must be pretty universal. Prof’s skills add up to Hollywood gig! So opines Doug Moe in the Wisconsin State Journal, which has a nice interview with me in tomorrow’s paper. Look closely and you’ll see that Ken Ribet has a photo credit! In case anyone’s coming here from the WSJ and wants to read some of the things mentioned there: you can buy my book here. You can read my Slate columns here, including my thoughts on Barry Bonds and the placebo effect. The best pizza in Berkeley (or anywhere) is Cheeseboard, and the best ice cream in Cambridge (or anywhere) is Christina’s, as described in The Restaurant Hall of Fame. To a guy like me, for whom “get this paper done in a hurry” means “within the next three months,” Moe’s output of five punchy columns a week is really startling. If you’re not already reading him, check out his recent columns on the surprising difficulty of street-naming and vanity plates too hot for the DOT. Despite Moe’s lightning speed, his article gets the facts right. Well, except one: I do not “nurse” my coffee. Cold coffee is gross. When it started up, Google Books had spotty coverage for literary fiction. But I’m happy to report that they now offer The Grasshopper King — well, not the full text, but all of the first chapter, and enough of the rest to get a sense of the book.